And now for the fouth sale announced this week as a conversation with Peter Croke at Merle Wood & Associates confirms that his co-central agency for sale with Merle Wood, Benetti's 56m Allegro has been sold. 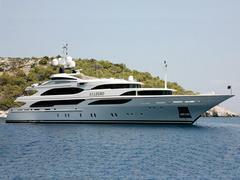 Noel Vawter and Mark Elliott of International Yacht Collection represented the buyer in the sale. Built in 2005 to Lloyds class and refitted in 2009, Allegro is MCA compliant, sleeping up to 14 guests in a master, VIP, two doubles, two twins plus two Pullman berths and was asking $39.5 million. As part of the deal, Noell and Mark's central agency for sale, CRN's 47.8m Azzura II was accepted in part exchange and is now being offered for sale through Merle and Peter as central agents. Azzura II, delivered in 1998 and refitted in 2008, sleeps 12 in a master, two doubles and two twins and is asking $11.9 million.